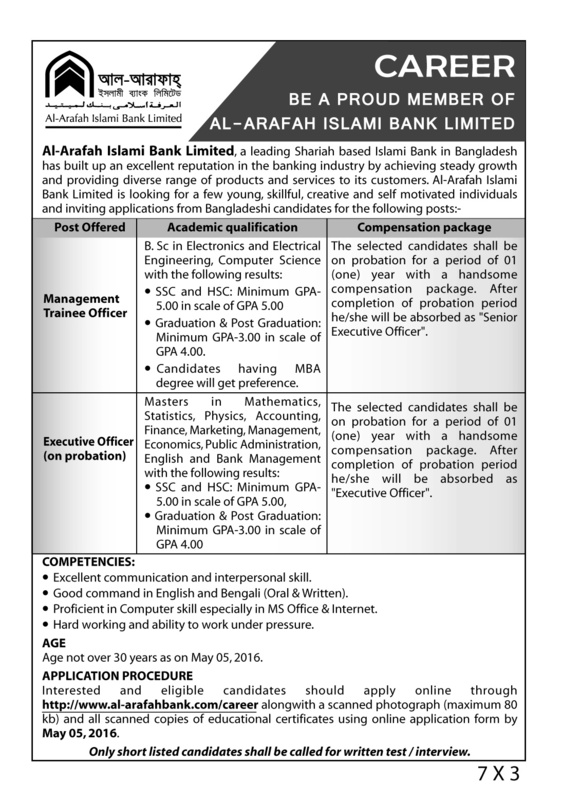 Al Arafah Islami Bank Job Circular 2019 . This is an Islamic bank in Bangladesh. Recently they are announce a career opportunity for the post of Management Trainee Officer and Executive Officer. 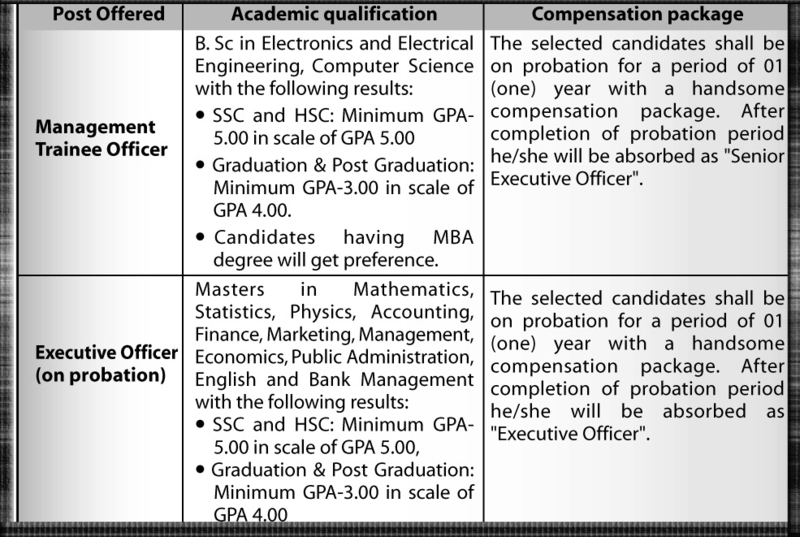 You can apply management trainee officer of executive officer post now. Before your application you must see your eligibility and their requirement. See their official website. Age limit : Not more than 30 years. Read their requirement that are included here. You can see the circular to confirm all information. You must be sure your eligibility to apply any of the post. Good command in English and Bengali (Oral and Written). Proficient in computer skill especially in MS Office and internet. If you think you are the right person for this job than application through online. So, at first chose your post. You can apply two post individually. If you think apply all post than go to their website. Here you see career option. Click this option then you see available job in this time. Select your chosen job and click that. Fill the form accurately and check it properly. After finish your checking you just click submit button. You must be full fill their requirement for apply any post. They are posting energetic and talent workers. If you have good result in your educational life then apply from our site. 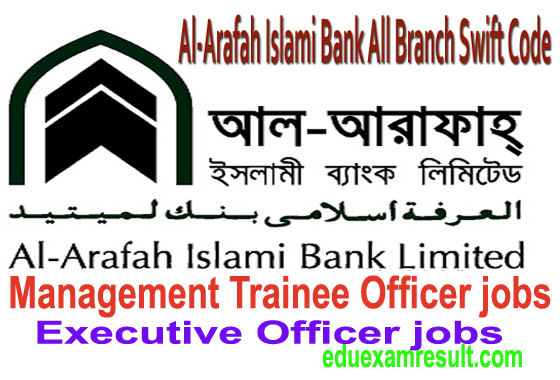 We are published here Al-Arafah Islami Bank Limited Management Trainee Officer and Executive Officer job exam result and seat plan. When they are announced job exam date and published seat plan then we are upload that our site. So, you don’t search here and there for information. You can get all kinds of information here about this job. At this time the application system are running. After finish application procedure they are listed candidates who are selected for written exam. You must be know they are called only short listed candidates. So, if you are a candidates of this job then apply and prepared for written examination. Nee more help? If you face any trouble to apply then inform us or construct the authority of Al-Arafah Islami Bank limited. You can visit their site for more information. Their official website is http://al-arafahbank.com. You inform us by comment or social media. Stay with us for more information. If you think need more information then share your opinion in comment section. You can also visit their site for information.